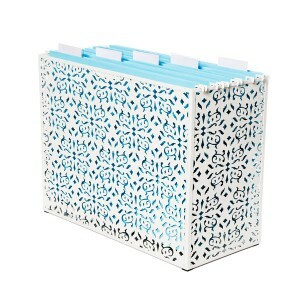 Paperwork organizing may be challenging for you, but it doesn’t have to be. I have taken control of my paperwork over the years by working on it a little at a time, sometimes daily, sometimes weekly. The key for me is to deal with mail as soon as I walk in the door. I walk to the kitchen, stand over the recycle bin and drop in whatever I don’t need. I open mail and immediately recycle envelopes and inserts… I filter out most paper clutter before it hits a surface. I then put bills and correspondence on a designated work area, my desk, instead of on the kitchen or living room table. I’m concerned about my name and address going into the recycle bin, so I tear off and shred it. 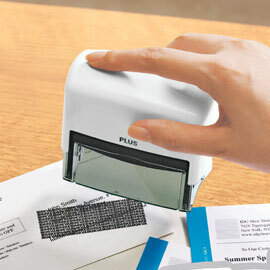 I also have an identity theft protection rubber stamp that I use at my desk, like this one pictured from Solutions.com ~ you can also get it on Amazon and at Bed, Bath and Beyond. If you get a lot of junk mail, go a step further by starting a shoebox size bin in which to collect unwanted mail, catalogs and advertising for a few weeks, and schedule a date on your calendar to call and get off those mailing lists. If you don’t want to make the calls, have Catalog Choice do it for you. You’ll start receiving less paper mail, which means less clutter to deal with later. What do I do with the paperwork that begins to pile up on my desk? Each night I sit at my desk and file away what I need to keep as reference. If you practice this daily for a few weeks, you can form the habit, really you can! It’s ok if you miss a day or two. But get back to it on day three. I use a cork board on the wall in front of my desk to pin up small notes, coupons, and important reminders. I take down and file or recycle weekly anything that no longer applies. 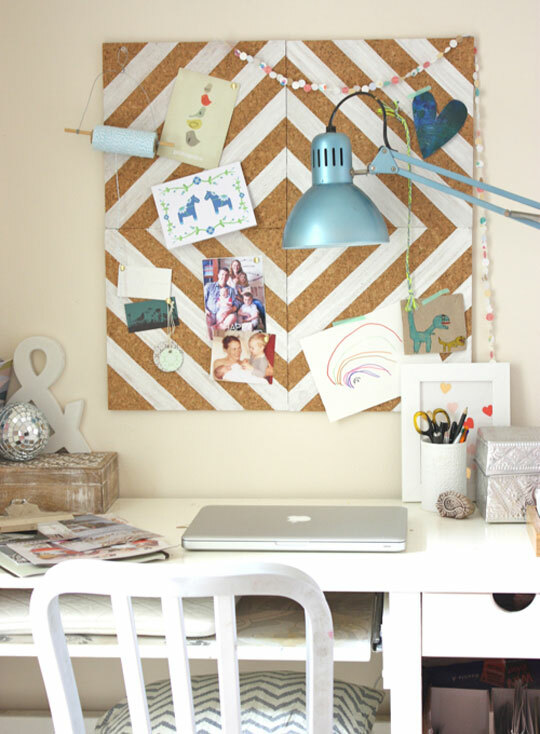 Here’s an example of a cute DIY cork board from Apartment Therapy, with a link to how to make one yourself! Don’t let bills and important correspondence go out of sight, out of mind. If not dealing with it immediately, create a specific area where you place and see them daily, such as standing upright in a desktop file folder, or pinned to a corkboard on the wall by your work area. Highlight or circle due dates on bills. That’s what I do and it works great! Car titles, repair and maintenance receipts. Personal identification, social security statements. Home improvement paperwork and receipts. Insurance documents for current policies. Warranties and manuals: things you still own. Receipts for high value home or office furniture, computers, electronic equipment, household goods, art, anything you may one day want to sell or may need for value reference in the case of a home or renters insurance claim. If you’re holding onto department store receipts in case you want to make a return, but the return date is expired, do you still need to keep the receipt? Sometimes yes, many times no. Any kind of tax document. When the year is up and it does not need to live in my active files, I store them with that years tax return in a closet designated specifically for this kind of storage. Since I run a business, my CPA requires that I receive all work-related receipts, bank and credit card statements in the paper format. But I’ve set myself up to get personal statements and receipts electronically. I log on regularly to pay bills and take a glance for funny business. So far, so good! Go paperless wherever you can. NOW is the time. Get online and learn how to receive statements, bills and receipts via email. Learn how easy it is to download and store them onto your computer as a digital document. If you ever need a paper copy, simply print from your digital storage file. Consider going paperless with one or two minor bills first. If you find this works for you, practice with other things. A little at a time steadily builds new habits. When signing up for something or ordering online, be sure to not check boxes that allow the business to send you paper mailings. It’s easier to remove yourself from email than mailing lists down the line. Download this Stop Junk Mail Kit created by the Bay Area Recycling Outreach Coalition for numbers to call and websites to visit to be removed from Direct Marketing lists, Credit Card offer lists, Sweepstakes, Shopping Flyers, Junk Faxes, Catalogs and more. We have individual needs to consider when it comes to dealing with paperwork. For this reason, I suggest consulting with your CPA or legal advisor about what you should be keeping vs. recycling. From my own home office and that of many clients I have worked with over the years, what I have found is this: we are quite more similar than different. So do not feel alone with your paper clutter! Deal with it a little at a time, but on a regular basis. If you’re not going to hire a professional organizer or personal assistant to come in weekly and do it for you, learning to self-maintain is key. And lucky you! Like good habits, getting organized with paperwork is something that can be learned. Ready for more? Call (510) 229-7321 today to schedule a complimentary estimate to get your paperwork or home office organized. Gift certificates are available.